The North Texas women’s golf team are slated to play in the Conference USA Championship on April 15-17 , finishing up a season of competing with nation’s top-ranked teams. The C-USA Championship match will be played in Fort Myers, Florida at the Verandah Golf Club. Throughout the season the women’s golf team competed with some of the nation’s top-ranked schools: No. 2 Texas (twice), No. 9 Kent State, No. 18 Clemson, No. 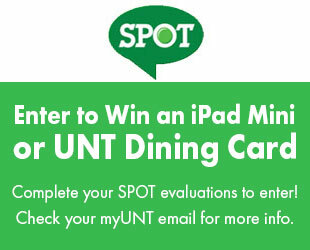 19 Texas Christian, No. 20 Miami, No. 27 Purdue, No. 28 Houston, No. 35 Baylor, No. 41 Ole Miss and No. 43 Texas Tech. After going through a season playing against numerous schools within Power 5 conferences, the Mean Green will face off against all of the C-USA teams — 12 teams in total. They will be going up against the weakest field they’ve played against all season, according to Akers. 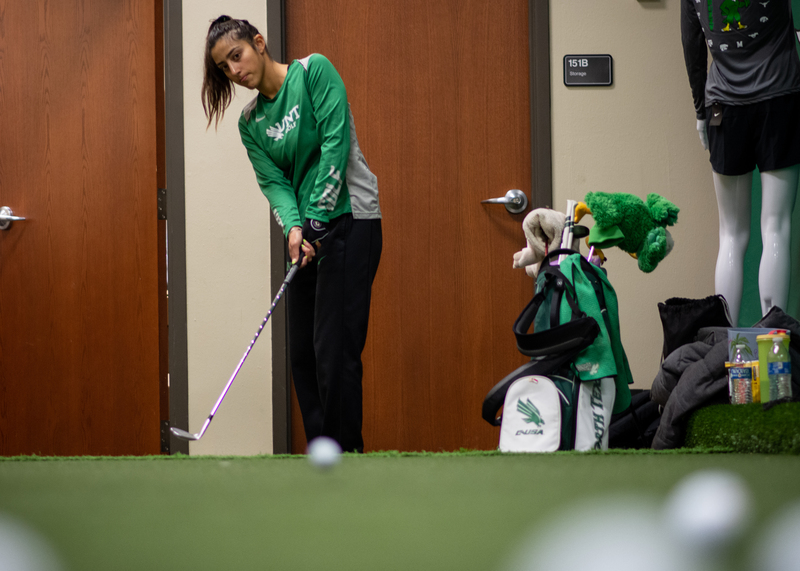 Mean Green senior Sabina Pena practices at UNT’s indoor golf facility. Image by: Will Baldwin. Junior golfer Lauren Cox and senior golfer Sabina Pena have had success at the Verandah Club, shooting 4-over par and tying for fifth place in the final player leaderboard last year. Cox is coming into the Conference tournament having broken the North Texas record for best round after shooting a 6-under-par 66 on the opening day of The Bruzzy tournament on April 1. Cox finished the Bruzzy tying with two other golfers for eighth place after shooting 2-under par in the final player leaderboard. Coming fresh off a record-setting match, Cox hopes to carry on this momentum and confidence heading into the tournament. After spending two seasons with North Texas, Pena hopes to finish her collegiate golfing career on a good note and perform well in her final conference tournament. Pena is already familiar with the physical conditions that the course will present and is instead choosing to focus on preparing mentally. With this being her final tournament with North Texas, Pena gave high praise towards Akers and talked about what playing golf for North Texas meant to her. 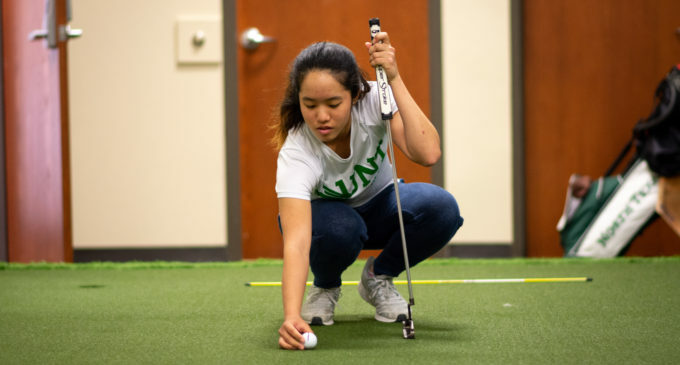 Featured Image: Mean Green freshman Audrey Tan sets up a putt at UNT’s indoor golf practice facility. Image by: Will Baldwin.